I remember my first Philly Cheese Steak sandwich. I was in high school and it was after a Philadelphia Flyers game. I was on a date (sorry, Lu!) and we were doing the whole Philly experience, so of course, it had to end with a cheese steak. Was it Pat’s or Geno’s? I can’t remember, but it certainly was delicious – greasy, cheesy, meaty, and worthy of the hype. However, it certainly wasn’t the healthiest thing I’ve ever eaten. I actually haven’t had a cheese steak sandwich since, but I randomly had a craving for one, after seeing someone’s post-Philadelphia-marathon Instagram picture the other weekend. The peppers and onions are lightly but perfectly seasoned with the simple seasonings of salt, pepper, oregano and garlic powder. 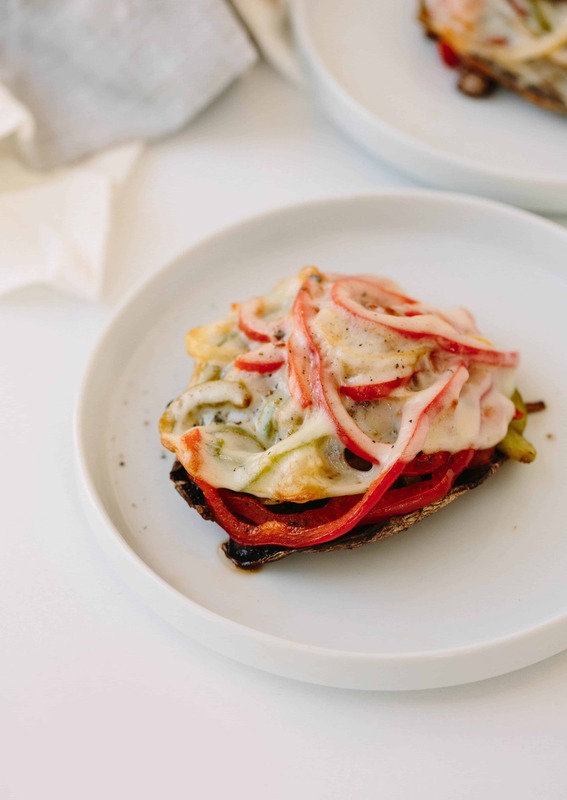 They’re packed into oven-baked portobello mushroom caps, topped with provolone cheese, and baked until melted and gooey. 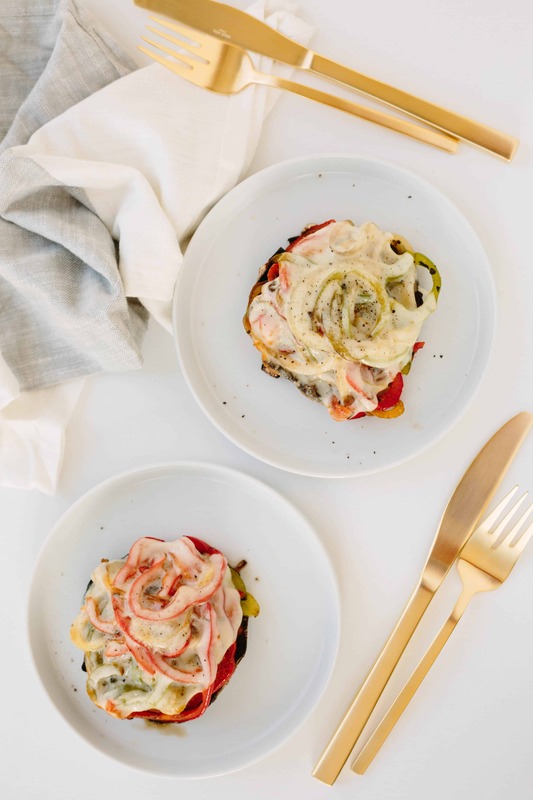 Now, nothing can really compare to a true cheese steak sandwich, but these definitely satisfy the craving in the meantime – the provolone cheese oozes into the spiralized bell peppers and onions and the mushroom keeps its firmness just enough to carry the toppings. If you haven’t had a portobello mushroom cap type sandwich, you’re missing out! 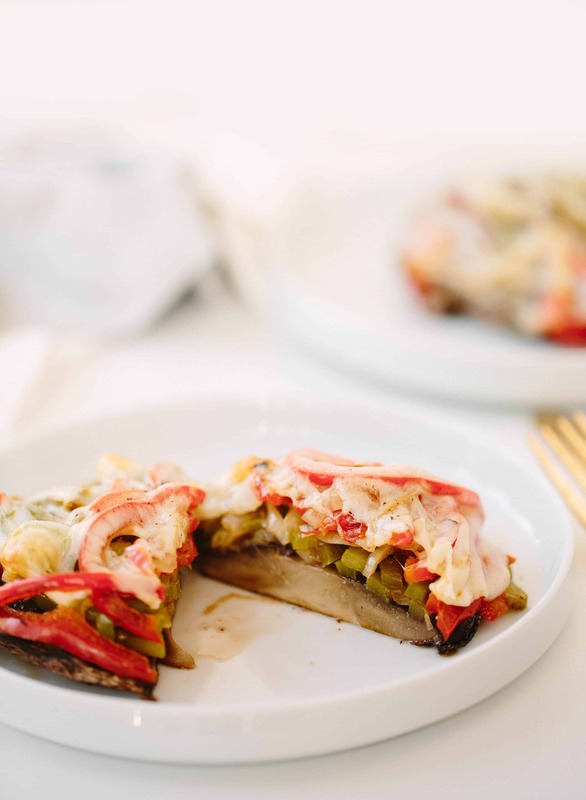 I still love my Tuna Melt with Spiralized Parsnips (made in a mushroom cap) from my first cookbook, Inspiralized. Just make sure to buy the largest mushroom caps you can find and carefully scrape out the gills. This dish saves well in the refrigerator and will reheat well, so make it in advance and have your coworkers begging you for a bite! Preheat the oven to 400 F. Line a baking sheet with parchment paper and set aside. Lay out the Portobello mushroom caps on the baking sheet. Spritz with the olive oil cooking spray season with salt and pepper. Roast in the oven for 10 minutes. When done, pat off any excess moisture. Meanwhile, heat the oil in a large skillet over medium-high heat. Once oil is shimmering, add in the bell pepper and onion noodles. Season with salt, pepper, oregano, and garlic powder. Cook, tossing occasionally, until bell peppers are caramelized, about 10 minutes. Pack each mushroom cap with the bell pepper and onions. Top each with a cheese slice (or two) and bake in the oven for 5-8 minutes or until cheese fully melts. Yum! Can't wait to try this. Thanks for sharing---I printed it. Sounds delish!! Can't wait to try this!!! BTW thanks for suggesting pans.... Now have a full set!! Looks great, but any video or instructions on inspiralizing a bell pepper? Oh, this looks yummy. Will try it out. Thanks. Why do you scrape out the gills? Is it just to make room for the filling? I have the same question. Did you try it with the gills left in? What's the calorie count, please.